55% of Mac owners have upgraded to Yosemite. El Capitan continues Apple’s long tradition of yearly updates to tis operating system for Macs. El Capitan is named after the giant granite cliff in Yosemite (the name of its operating system predecessor). While last year’s Yosemite update brought big changes in the user interface, El Capitan is focused on smaller tweaks above and below the hood. Apple’s senior vice president of Software Engineering, Craig Federighi, began by noting that Yosemite has been a huge hit. It saw the fastest adoption rate for any PC operating system with 55 percent adoption, compared to just 7% for Windows 8.1. Building on that success, El Capitan brings a improvements to user experience and performance, withe better and smarter Spotlight, new windowing modes, and better bare-metal performance with Metal for Mac. Disappointingly, there was nary a mention of the new system font (San Francisco, which debuted on the Apple Watch), nor fixes to Yosemite’s widely problematic networking features. Craig Federighi demos Safari improvements in OS X El Capitan. Safari is getting a new feature called pinned sites. Favorite sites that are visited all the time can be “pinned” to special tabs, allowing them to sit on the wings of the main browser window and be quickly opened with just a click. Pinned sites are automatically opened when the browser window is opened and closed. It looks handy and useful. And — drum roll please — Safari finally keeps track of tabs that have audio playing. Tabs can be muted just by tapping on them. In my book, this is one of the biggest missing features of Safari. It’s been available forever in other browsers, like Chrome, and is an essential feature of a modern browser. 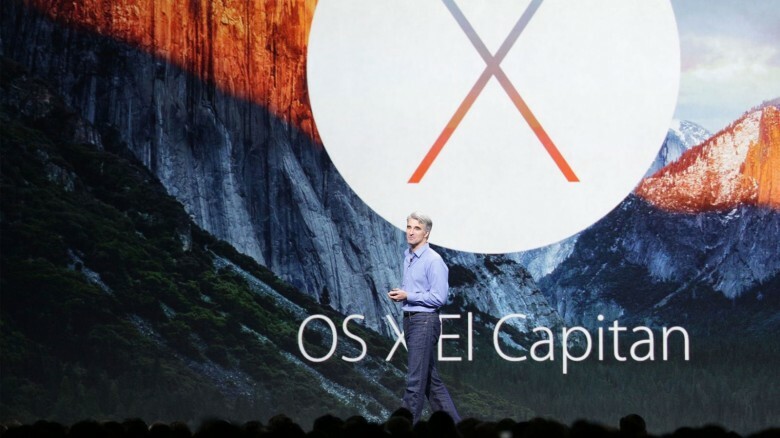 Craig Federighi demos search improvements in OS X El Capitan. The Spotlight window in El Capitan now includes a resizeable window. Hurrah – the old one was horrible. Craig Federighi demos split-screen multitasking in OS X El Capitan. Several built-in apps get new gesture controls. The built-in Mail app, for example, gets swipe controls that allow messages to be quickly deleted or marked as unread, for example. It works just like the swipes in Dropbox’s Mailbox app, and others, and is a big time-saver. El Capitan also has a cleaner and faster Mission Control, which zooms out to show all the system’s open windows. A three-finger swipe ip reveals all the open windows. There’s also a very Windows-7-esque feature that lets you snap two app windows to the side of the screen so you can look at them side-by-side. This looks super handy when working between two separate apps. No more tricky switching between them — they are there, side by side. Epic Games shows off Metal running in OS X El Capitan. Federighi boasted of widespread performance improvements across the system, but concentrated on Metal, Apple’s graphics technology first developed for iOS devices. Unveiled last year, Metal provides apps with very low overhead to the hardware’s GPU, offering games and graphics faster. On the Mac, it’ll make not just games faster, but all apps, Federighi said, offering a 40% reduction in CPU processing power for graphics. In a lot of cases, he said it adds 10x performance increases — yeah, ten times better performance on the same hardware! That’s a big, big boost. It’s also great for high performance apps, Federighi said. He said Adobe has already used Metal for Mac in its AfterEffects software, and he invited Epic Games on stage to show off a game made with Metal, called FortNite. the game showed impressive graphics-heavy performance with little CPU overhead. The beta of El Capitan for developers is available today from Apple’s dev site. A public beta is coming in July (sign up here) and the official release, which will be free, will be available in the fall.